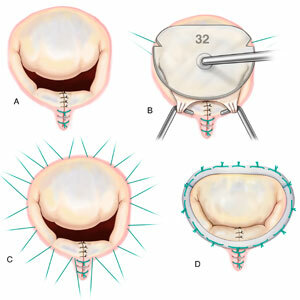 An annuloplasty ring is sewn into the heart during mitral valve surgery to stabilize the repair. After addressing the prolapsing segments in the anterior and/or posterior leaflet, attention then turns to restoring normal annular geometry (Figure 1). The normal ratio between the antero-posterior (septo-lateral) and transverse diameter of the mitral annulus is approximately 3:4 during systole. This ratio inverts in patients with chronic mitral regurgitation resulting in poor leaflet coaptation, even in segments not prolapsing. 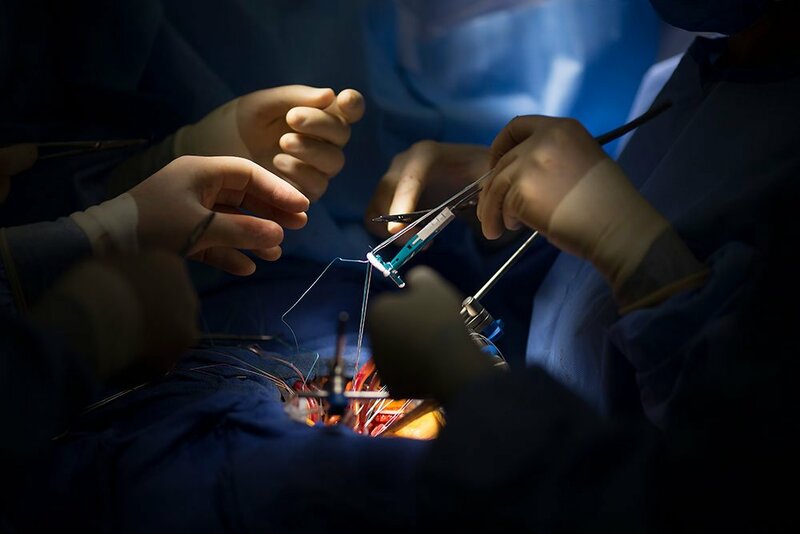 A remodeling ring annuloplasty restores the physiologic ratio of the normal annulus during systole, restoring not only the size but also the shape of the annulus. An annuloplasty ring prevents further annular dilatation, preserves leaflet mobility, and relieves tension on the leaflets (stabilizing the repair) by optimizing the coaptation zone. An annuloplasty is performed by first placing horizontal mattress sutures circumferentially through the annulus. Appropriate ring sizing is then based on measuring the inter-commissural distance and also the surface area of the anterior leaflet, using sizers correlated to normal mitral geometry (Figure 1b). The annular sutures are then equally spaced in the area between the two commissures and the corresponding segment of the prosthetic ring. In the remaining portion of the annulus, the spacing is set to conform the annulus to the shape and size of the prosthetic ring. When the ring sutures are tied the ring re-shapes the annulus to a normal systolic geometry (Figure 1d).